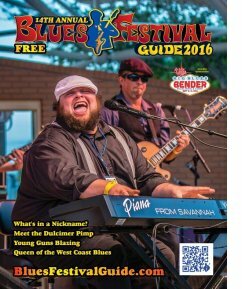 Get your copy of 2016 Blues Festival Guide magazine. Click here to order! Enjoy our feature stories (listed below and via link below) …And of course, hundreds of festivals. 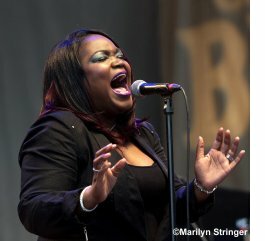 Every year, the Blues Foundation presents Keeping the Blues Alive (KBA) awards to both an international and a U.S. blues festival, in recognition of their significant contributions to the blues community. This year, honors went to the Cahors Blues Festival and the Chenango Blues Festival. The Music They Played on 7th Street Oakland Walk of Fame pays tribute to the great musicians, club owners, record companies and related independent business that put 7th Street, Oakland, CA, on the map as a top entertainment destination. Members of the Blues Festival Guide team are in Memphis for the Blues Music Awards, the Blues Hall of Fame inductions, and all the doings surrounding this special week. They have lots on their agenda but are hoping to be able to say "hello" to you! Look for (from Lt-Rt) Kaati (publisher) Cheryl O'Grady-Yearnshaw (sales director), Tom Andrews (sales rep). and Belinda Holloway-Harker (BFG rep). Have yourselves a blues ball in Memphis! just dates and venue. Easy and free. Find out how easy! 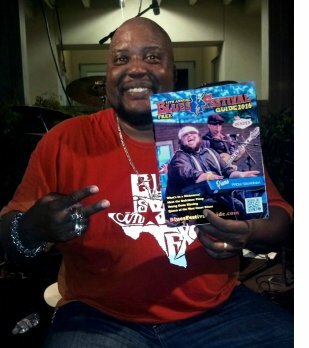 We had the pleasure of catching up with Sugaray Rayford at a "Wine, Brews & Blues" fest in Escondido, CA on April 30th. Here he is showing off the brand new cover of the 14th annual Blues Festival Guide print magazine. *NOTE! The NEW 14th annual edition has being shipped and those that ordered quantities, like blues societies and festivals, etc, should start distributing very soon. When you get yours, snap photos of you, your friends, artists, etc. with the 2016 Guide! *EMAIL photo plus caption & credit. 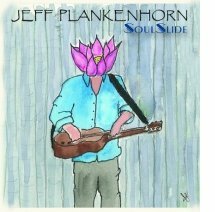 Acclaimed Austin-based guitarist Jeff Plankenhorn, who’s worked with a host of high-profile artists including Joe Ely, Ruthie Foster, Bobby Whitlock and Ray Wylie Hubbard, stepped into the solo spotlight with his new CD, SoulSlide, on Lounge Side Records. Throughout SoulSlide, Plankenhorn plays a blend of blues, soul and rock on a stand-up lap steel guitar dubbed “The Plank” (which also happens to be Jeff’s nickname), which he designed and is in the process of beginning mass production. 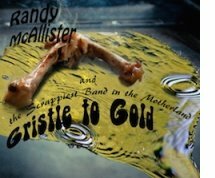 Randy McAllister’s latest release, Gristle To Gold, features The Scrappiest Band in the Motherland, with Maya Van Nuys, Rob Dewan and Matt Higgins. Randy McAllister has been flying in the face of convention his whole career... no smoke, mirrors, choreography or industry machines. One of the most versatile bluesmen in Texas, Randy plays driving drums and world-class harmonica, writes incredible songs, and sings like no one else. Raised in the small Texas town of Novice, McAllister is a fifth-generation Texan whose father was a fireman and a drummer in a band called The Flames. Randy followed in his footsteps from a very young age, but the drums were just the beginning. McAllister found the harmonica in his early 20s while stationed in Massachusetts as a member of the US Air Force, taking cues from Boston blues legend and harmonica master “Earring George” Mayweather. "The Kid With The Really Old Soul"
TRINIDAD, CO - The Trinidaddio Blues Fest will be held Saturday, August 27, 2016 in Central Park in Trinidad, Colorado. Tickets are on sale now via the website. 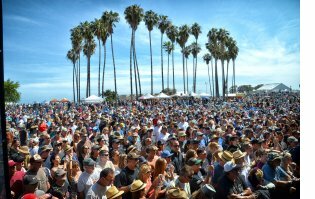 Doheny State Beach, a 62-acre California State Park, has been home to the Doheny Blues Festival for nineteen consecutive years. 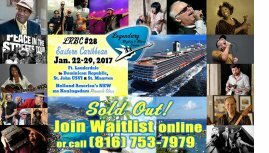 Attendees can enjoy this inviting festival layout with breathtaking harbor views, highlighted by three stages of alternating music. 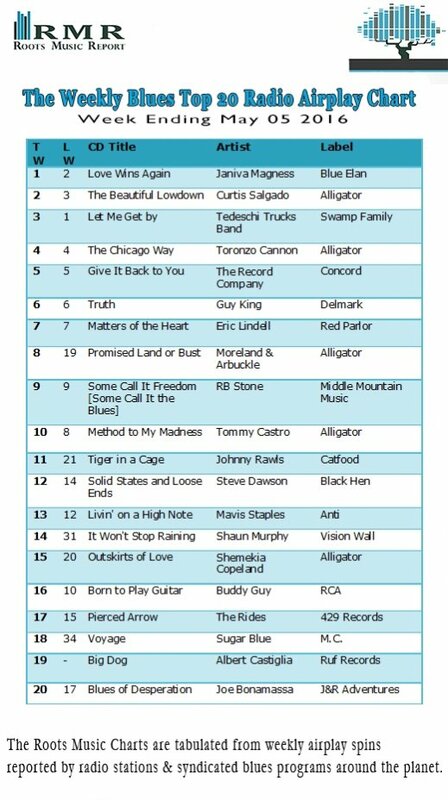 SAN DIEGO, CA - Now in its 15th year, San Diego’s Gator By the Bay, May 5-8, 2016, has become a wildly popular San Diego festival tradition, known for presenting an eclectic mix of musical styles and a fun-filled atmosphere. 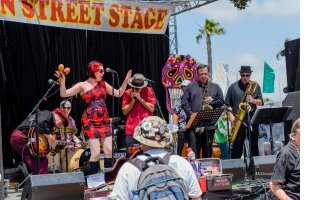 Wander among the festival’s seven stages at Spanish Landing Park, and you can listen---and, of course, dance--- to over 90 performances of everything from authentic Louisiana Cajun and zydeco music to Chicago and West Coast Blues, from Latin to rockabilly and swing---and more! This year, several new experiences are sure to add to the historically high level of enjoyment. 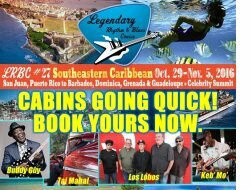 For starters, the stellar lineup includes blues greats Roy Rogers, Curtis Salgado, John Nemeth, Kid Andersen, Rick Estrin, Sugaray Rayford, Kid Ramos, and a host of others. MEMPHIS, TN - Ghost of The Blues will be appearing in Memphis at The Orpheum Theatre on Friday May 6th, 2016, the day after the BMA’s. 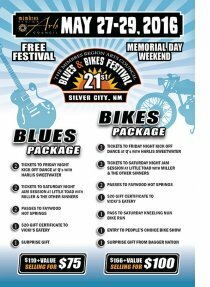 SILVER CITY, NM - The 21st Annual Silver City Blues & Bikes Festival, held May 27th – May 29th, 2016, at Gough Park in Silver City, NM, announces their Memorial Day weekend line-up and special events. The Mimbres Region Arts Council’s (MRAC) FREE Silver City Blues & Bikes Festival moves into its third decade with Taj Mahal, Blues Hall of Famer, Lifetime Achievement and 2-time Grammy award winner headlining Saturday night, May 28. The festival starts Friday, May 27, at 6 pm, in Gough Park with music by Las Cruces Blues guitarist CW Ayon. At twilight, the Busted Knuckles Harley-Davidson Stunt Tour will perform stunts that include wheelies, acrobatics, jumps, and more. Blues Fest food vendors and W & N’s beer garden will be open for business and will be available during the festival. NEW YORK, NY - Blues for Peace is a grass roots movement of musicians, music promoters, music venues, and anyone who wants to help promote peace. 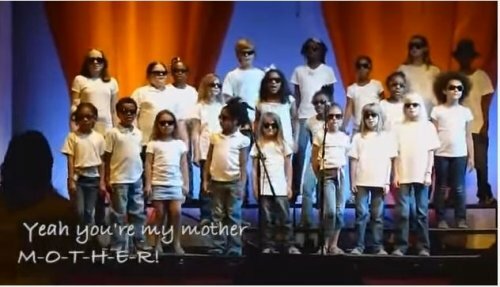 On May 27, 28, 29, 30 2016 there will be musical events in cities and towns around the world sending a message of peace. “Blues for Peace” has partnered with the USA for UNHCR the UN Refugee Agency and will be raising money to assist refugees world-wide. 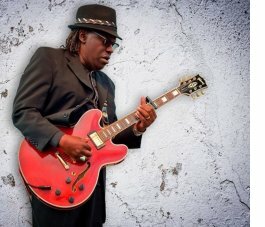 In New York City, the award winning Joe Louis Walker will perform a Blues For Peace event May 28 with Michael Packer, Paul Nelson, Jeannine Otis and the St. Marks Church Choir, Christine Santelli, and many more at the famed Washington Square Park (5 Ave, Waverly Pl., W. 4 St. and Macdougal St.). WINTER PARK, CO - This year's 14th Annual Blues From The Top Festival features its finest music lineup yet, with a reunion by renowned Blues-Americana group, Trampled Under Foot! The festival - presented by the Grand County Blues Society, takes place Saturday, June 25 and Sunday, June 26, at Hideaway Park, 78820 US Highway 40, in Winter Park. A portion of the festival's proceeds benefit Blue Star Connection, now in it's tenth year of providing access and ownership of musical instruments for children and young adults with cancer and other serious challenges, as well as providing music therapy departments with instruments. Blues Music Awards just a week away! 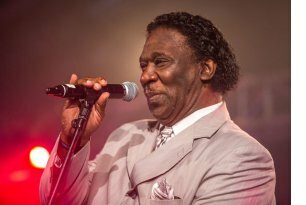 MEMPHIS, TN – The Blues Foundation annual Blues Music Awards will be presented at the Cook Convention Center in downtown Memphis, Tennessee, on Thursday, May 5, 2016. Purchase tables and single seats ...If you haven't done it, book your room at the Sheraton Hotel. As a reminder, here is the list of Nominees. There will be a ton of things to see and hear while in the area during BMA week not to mention the star-studded awards ceremony! "Eric Bibb describes himself as a troubadour. He is a very busy musician who is constantly touring and continually recording new material. I've had the pleasure of working with Eric on my "Rhythm, Roots and Soul" series as well with Eric and his legendary father, Leon Bibb on an episode of "God's Greatest Hits" for Riddle Films. In January of 2016, Eric was kind enough to sit and chat with me in Toronto about his life in music. (Music: "Leaving" by Steve Strongman. Special thanks to Sari Matinlassi, Holger Petersen, Bruce Greenaway and Gary Vaughan.)" 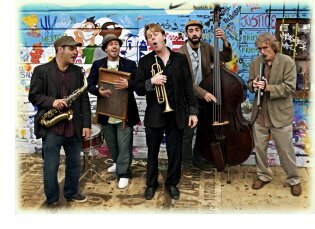 The California Honeydrops started out busking, passing the hat, playing for commuters and passing tourists at subway stations in northern California. 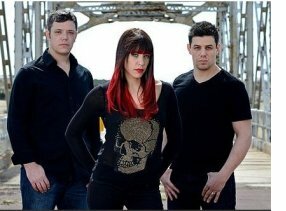 But now their everything-but-the-kitchen-sink brand of music has earned them an enthusiastic following at festivals and venues around the globe. Now that party comes to the BluesMobile! The California Honeydrops. Next time, in the Bluesmobile. Happy Mother's Day May 8th! T-Bone Walker Blues Fest, Inc.